A group of Kanwariyas had broken a car’s windshields, windows and headlights with baseball bats even as a policeman tried hard to stop them in Delhi’s Moti Nagar. A 22-year-old man, identified as Yogesh, was arrested on Monday evening for allegedly being part of a group of Kanwariyas involved in vandalising a vehicle in west Delhi last week, police said. The incident took place on August 7 on a busy stretch of the road near Moti Nagar Metro station, causing a traffic snarl and forcing some of the commuters to take a detour. The police scanned the CCTV footage and registers of nine kanwar camps on Najafgarh Road to identify the accused. They had arrested another accused Rahul Billa on August 9 in connection with the attack. Yogesh was found after Billa informed the police that the accused were residents of Uttam Nagar, said the police, adding that Yogesh was one of the main accused who was involved in toppling the car and vandalising it with baseball bats. He has told a couple of names of his accomplices to the police and the investigators are on the lookout for them. A group of Kanwariyas had vandalised a car in Delhi after it allegedly brushed one of them. “One of the Kanwariyas got pushed by the vehicle, which resulted in heated arguments between them and the occupants of the car — a man and a woman. One of the Kanwariyas was also slapped by them, which further agitated them and they started damaging the car,” Deputy Commissioner of Police (West) Vijay Kumar had said. A video clipping, showing the pilgrims damaging the vehicle with sticks, had gone viral on WhatsApp and Facebook. 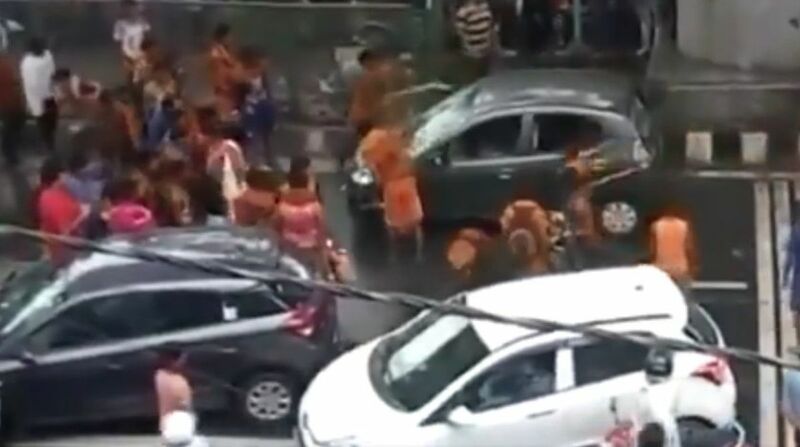 The video showed the Kanwariyas break the car’s windshields, windows and headlights with baseball bats even as a policeman tried hard to stop them. The rampage came to a halt only after the unidentified miscreants overturned the car in the middle of the road. The couple fled the scene fearing for their lives and refused to give any complaint in writing, the police had said earlier.